In my Outlook, which syncs with my iPhone, I maintain a note entitled “BURGERS.” It’s a list of Burgers that people suggest I consume here in the NYC area. That list has been there for years and every so once in awhile I get a chance to knock one off of it. FYI, there is another note entitled “Out of state burgers,” for suggestions that fit the title. On this Glorious 26th day of National Hamburger Month, I got a chance to try a Burger that was suggested to me by my pal Jamie Roberts. 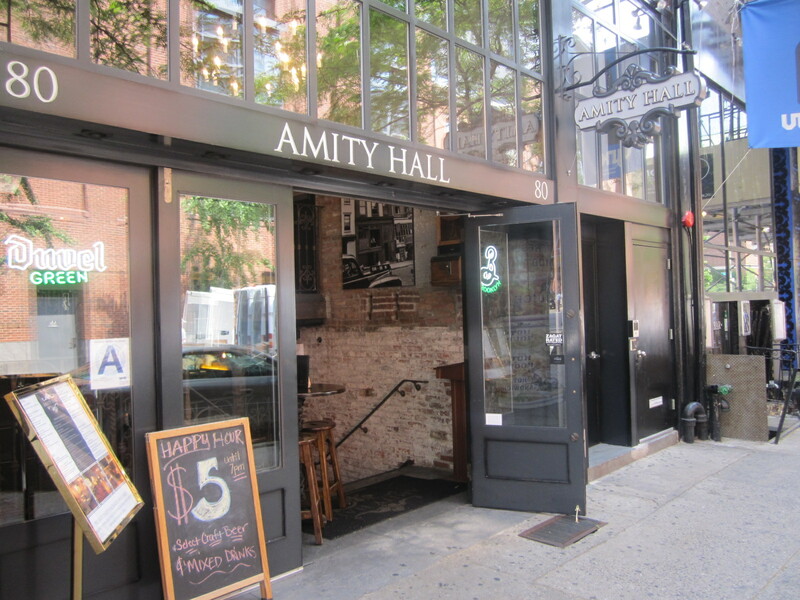 Nestled right in the heart of New York’s West Village, right behind NYU, you’ll find Amity Hall. How students can focus on studying when there is 60 draft lines, 140+ different bottles of delicious craft beer and stuffed Burgers practically sticking out their tongue and waving at their University is a worthy of a governmental investigation. The bar has two floors which begs the question, which came first, the capacity or the beer taps. 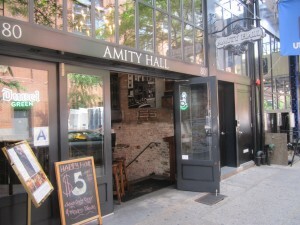 Amity Hall’s aggressive craft beer program is centered around something called the “101 Club.” Bar patrons can plunk down a $20 deposit for a “beer passport” and once they have consumed 101 different beers at Amity Hall, they get their name on a bronze plaque that is placed on a special section of the wall. Only stopping by once and don’t have the intestinal fortitude for a century club plus one, no worries, they offer drafts by the pint, pitcher or tower. What to do, what to do!??! I mean seriously, this menu, much like Amity Hall’s craft beer program, screams “collect them all!” After much indecision, the friendly and fun bar tender, Amanda, along with a Beer 101 Club member, suggested I go Angry. 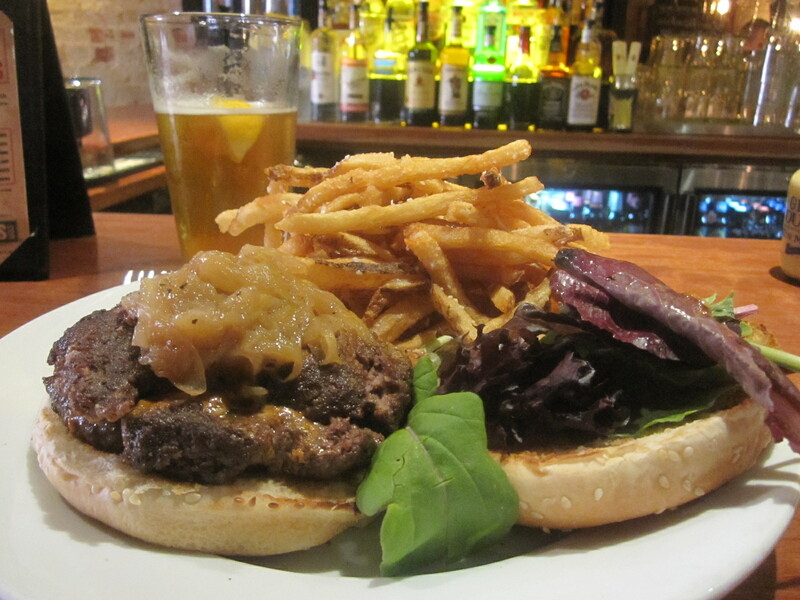 Taking into consideration what I anticipated being a Spicy, Smoky and Savory Hamburger, I decided to pair it with Rogue’s Mom Half-E-Weizen. It’s an unfiltered, Belgian style wheat beer that is spiced with Coriander & Ginger. It’s spicy, yet sweet profile was going to counterbalance the Burger madness I was about to invoke. It’s very salty in it’s profile, which is to be expected and very tasty but it will most certainly make you want to drink more beer! The Chef uses a lot of spicing in the Burger along side of the Chipotle Peppers but somehow is able to maintain a balance of taste between it and the fresh ground Beef. Likewise, the spicy are spicy but not really hot. This is a skill and one that clearly wasn’t developed over night. The Blue Cheese, which is incredibly melty and the Sweet Onions counteract the spicing and give this Sandwich a well balanced mouth feel. But let’s be honest, if you are eating this Burger, it’s not because you wanted a simple and classic, plain old American Cheese Burger. 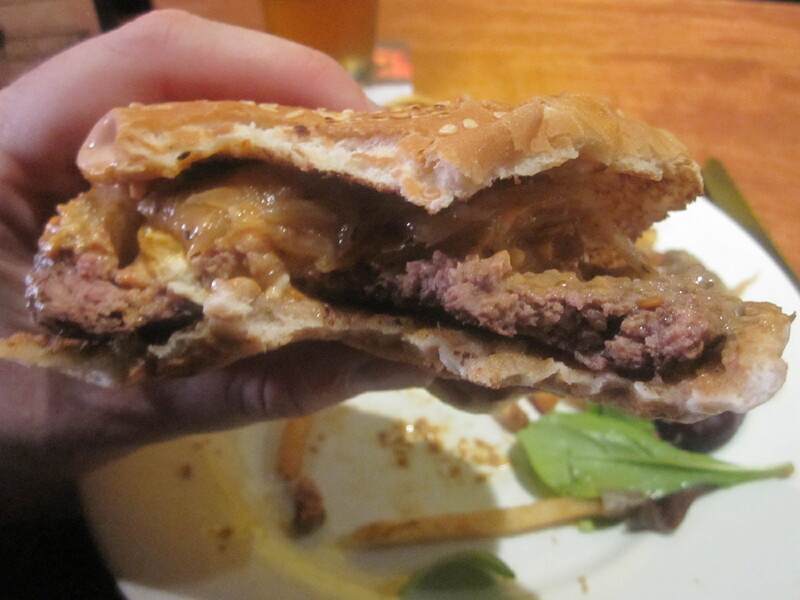 You came to Amity Hall because you wanted a Burger Conquest. Go get this Burger NOW and then come back to reading this post and then you can agree with me, this is one of the most unique and interesting Burgers in all of the Big Apple. Amity Hall scores an 8 on The Rev Meter. This entry was posted in Bar, Beer, Burgers, Gourmet Burgers, Hamburgers, National Hamburger Month, New York and tagged amity hall, burger, cheese, ciancio, conquest, craft beer, french, fries, great, hamburger, micro beer, national hamburger month, new york, ny, nyc, rev, review, stuffed burgers, the, the rev meter for social community, west village. Bookmark the permalink.